Silk saree brings a whole new level of class and elegance when draped properly. There are many variants available in silk sarees such as Pashmina silk, Kanjivaram saree, Paithani silk saree, Nalli silk and more. Silk saree exudes unparalleled grace and looks gorgeous on any occasion. They are the best bet to come out of the boring cotton routine. When it comes to draping saree, silk can be a bit tricky fabric to work with. The key is to focus on the drape and pleats. If you love to wear sarees then learning to drape a silk saree would not at all be a huge deal for you. As rightly said, there is nothing that Indian women can’t conquer! Although silk sarees are known for their smooth texture yet majority of Indian women like to wear it on special occasions and are able to carry it quite like a vision. Without any further ado, let us present you the right technique to drape this classy ethnic outfit. Follow our step by step draping tutorial to master the technique of draping the most gorgeous of sarees­—silk sarees. Let’s get rolling. First thing first! Choose a cotton petticoat to wear before you start the actual draping. Avoid a satin petticot entirely. A cotton petticoat will ensure that the saree stays in place and there is least chance of slipping away or going out of hand. The next thing to ensure is that petticoat is tight enough so that saree can be tucked in properly. Put on the blouse and we are all set to drape the silk saree. Start with the plain end of the saree and tuck it on the right side of the waist. Bring the other end to form a circle so that it covers the petticoat entirely and bring it until you reach the right waist again. Keep tucking the fabric in between while encircling the drape. Now continue tucking it into the petticoat and make sure that the sari bottom skims the ground. As you complete tucking the saree till it completes one round, keep some loose fabric for the pleats. You can measure it by roughly with a simple technique. Keep the saree on an arm’s length starting from your waist and set it aside for the pleats. Now hold it way from you and at the same time, tuck in the other end of the saree. Tuck it into petticoat in such a way that it forms a loose loop. This loop will further be used for pleating which is explained further in the next steps. This one is an important step. Pleating is what imparts the grace and elegance to the silk saree. The drape of saree and its entire look depends on how neatly you have made saree pleats. To start making pleats, take the free end of the saree and bring it towards the front till your hand’s length. Now fix a finger to hold them firm and continue making more pleats. Keep making a few pleats and at the same time make sure that you are firmly holding the ones that you have made already. You can make approximately 6 to 8 pleats or as you like. 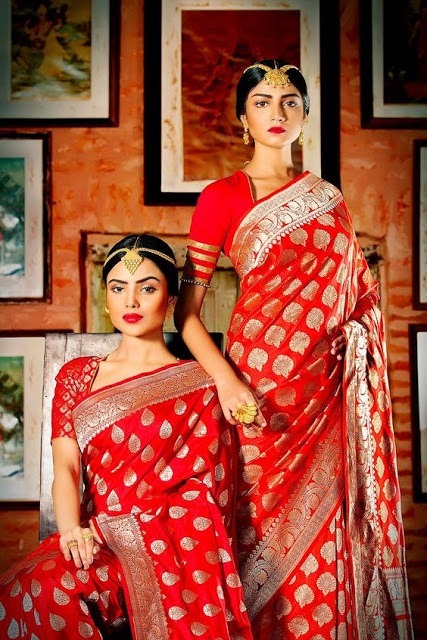 Now is the time to tuck in those neatly made pleats into the petticoat of the silk saree. While tucking in the pleats, make sure that you have held them firmly and they don’t undo themselves as soon as you release them. While holding them with caution, tuck them into your right side of the waist, just half an inch below your belly button. Arrange the pleats properly and secure them with a safety pin. Also, arrange them in such a way that the border of the saree is showing up on the front. Secure them along with another safety pin if needed. Once you are done with the pleats, keep the process of draping the saree in circle and tuck it into the petticoat along the way. Tuck it until it reaches the edge of the loose end and while doing this, keep in mind that the hem is outwards. If you are planning to wear the saree with the heels, then make sure that you don’t tuck in the saree and the pleats too high as it will make it less appealing. So the best thing is to wear the heels before you start draping the saree. The draping process of silk saree becomes a lot easier that way. Now, let us move to setting up the ‘pallu’ or ‘aanchal’. It is essentially the loose end of the saree that is left after pleating and tucking and goes on the shoulder. Pallu is the decorative end of the silk saree and all you have to do is to grab it in a way that it goes over your left shoulder. While doing this, make sure you start by putting it under your right arm and then take it all the way towards the left shoulder. You can pleat the pallu if you like and secure it with safety pins. While doing this, ensure that the ironing of your silk saree is not ruined. A well-ironed pallu is an added charm to the silk saree. To secure if safely, take a few safety pins. Make two or three pleats. Pin up the pleats one by one on left shoulder as you are making them. Keep them fixed and leave no chance of imperfection in your attire. 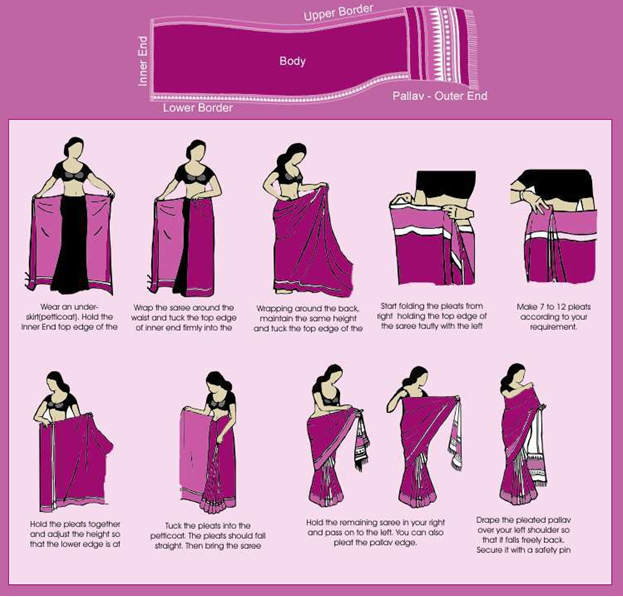 The final step is to ensure that the saree is pinned up properly and your chest area, as well as stomach area, is well covered. Also, check that the border of the silk saree is clearly visible when you are done draping the silk saree. So give a finishing touch by pinning up the saree in a way that it balances out both flaunting the design as well as covering up your frame so that you look graceful.